I’m running this program called Autumn Maker School. The requirement is that you make ten things. Ideally they should be useful. So far I’ve made a few things: a first-draft volvelle, and a computer program that calculates the area and perimeter of a hexagon or other polygons, and a little graphic design puzzle based on Khonsu the Egyptian god of the moon. //embedr.flickr.com/assets/client-code.jsToday I made a braiding disk. I made a 12-notch variant of this one, because third-graders learn about calculating time, and this way you can teach kids time movement at the same time that you teach them braiding. It’s not a particularly complicated device. But it meets one of my key criteria for success in the design lab: using our tools to make a tool that makes a thing. I love it when a kid uses our carpentry tools to make a tool that makes something else — and the idea of using a tool-set to make a braiding tool which then allows kids to make friendship bracelets for one another, and maybe cord which can be attached to their clothing, and so on… that pleases me. The third grade teacher seemed pleased too. 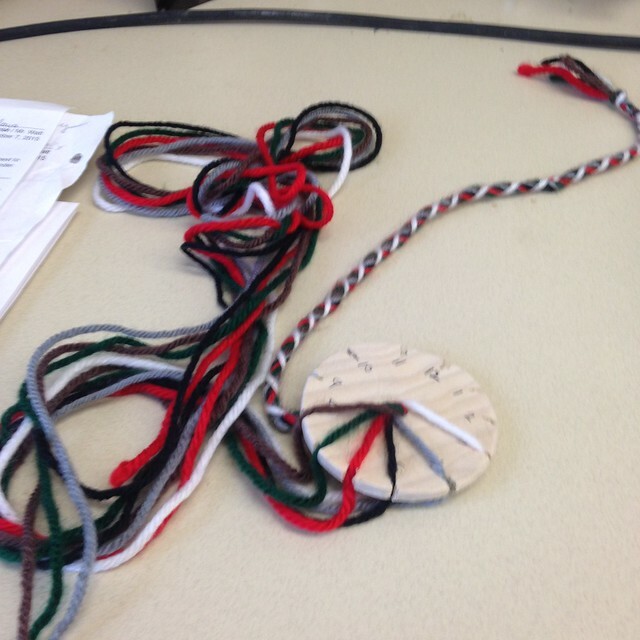 My tentative plan calls for making another twenty-five braiding disks over the next few weeks, so that then we can teach the third graders how to braid. Those kids will then (hopefully) be more interested in working with cord, braid and similar materials in the future, and the weaving and dyeing and sewing programs I’ve worked on developing will make more sense. It should be good. The disc itself is not particularly complicated. It’s simply a piece of poplar, cut in a circle, and then notched twelve times around the edges. The center hole is an artifact or side effect of the circular saw cutting through the wood. The numbers are currently put in place with pencil; a final version would have wood-burned numbers, probably on both sides. I think I’ll have to make a little guide with seven or eight patterns in it, as well, a booklet that kids can assemble — some with three strands (hour, minute, and second hands? Hah I’m on to something here! ), some with four strands, some with five, six, seven, eight and maybe even eleven.